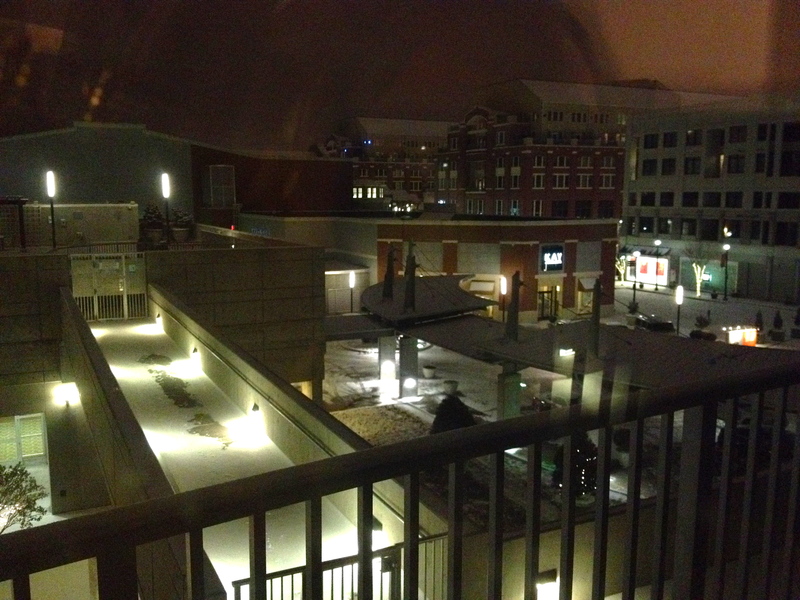 Date Night spends two days downtown, snowed in by the recent deluge of “Devil’s Dandruff” from the skies. Fortunately, we were able to get a hotel room, but many restaurants were closed and we had to “forage” for food at the places that were open. Here’s some of the highlights of our two nights of “roughing it” downtown. While we figure out where we are staying, we duck into Dantanna’s for some beers and appetizers. They have a decent beer list and lots of big screen TV’s to watch sports on. 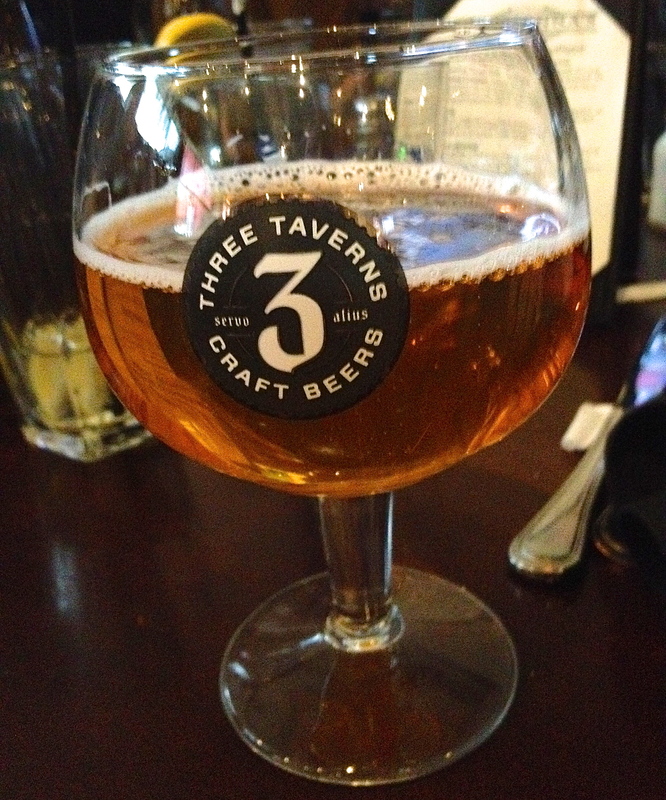 The Three Taverns Single Intent is one of our new beer favorites. It’s a Belgian single brewed in Decatur. If you like Belgians, you need to try this beer. What we really need to be watching now on those huge TV’s is The Weather Channel because it’s getting nasty outside. I order a soft pretzel, which comes out half soft and half overcooked and crunchy. I should have sent it back, but the weather is more of a concern than the food. 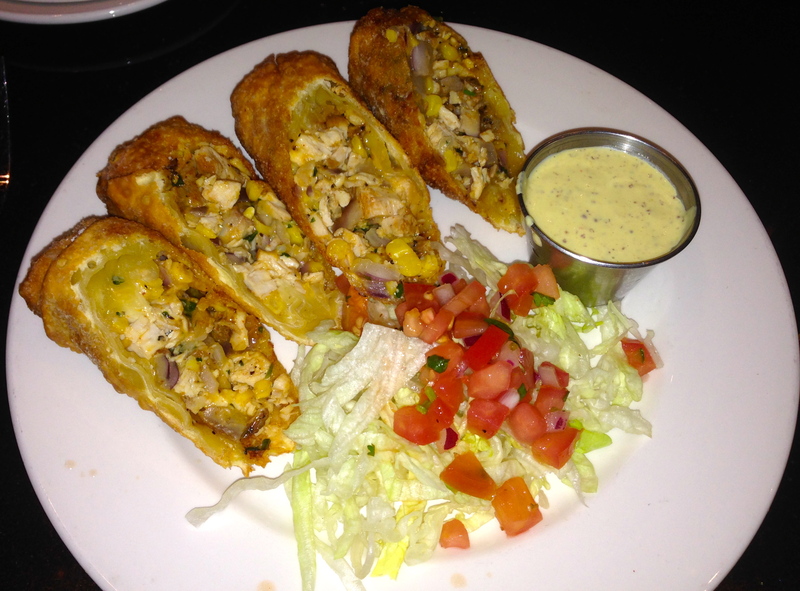 The Cajun chicken egg rolls are good and have a spicy kick to them. 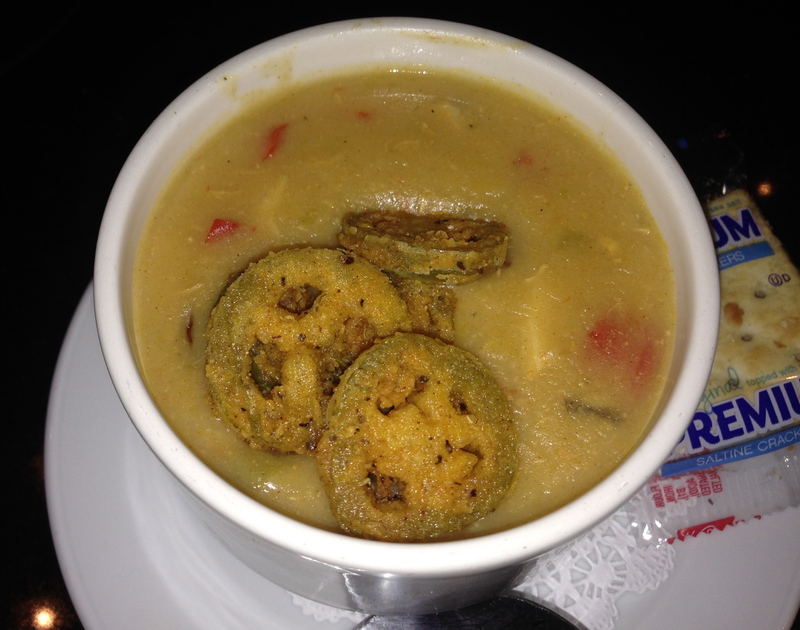 The gumbo is topped with three slices of fried okra, which is a nice touch. It’s full of spicy chicken and sausage and is excellent on this cold night. Speaking of chicken, there is a chicken convention in town with 25,000 visitors and Dantana’s is packed. Dantanna’s is a good place to meet, either after work or after your convention. Unfortunately, the CNN Center closes down at 7PM, as does Dantanna’s, and the poultry people must leave. We make our way to our hotel in Atlantic Station via MARTA and by foot. It’s not pretty out there. 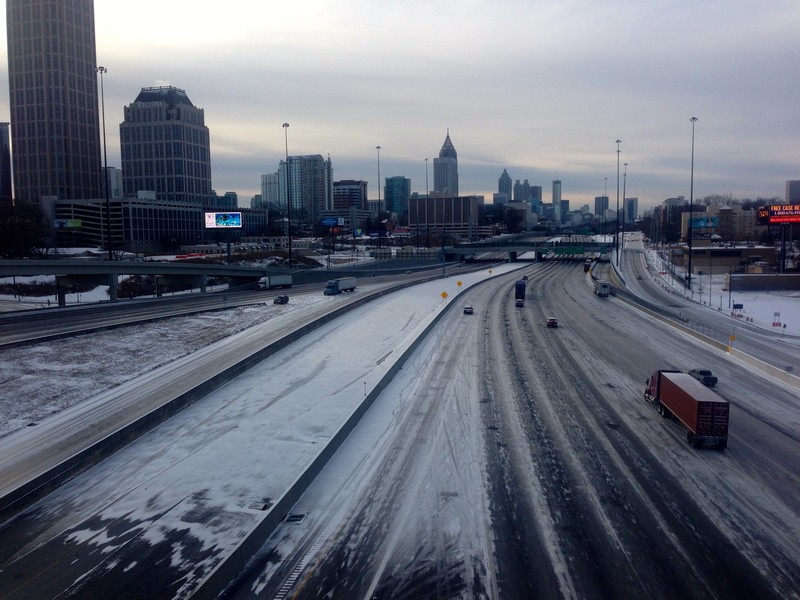 The next day, I walk to back to the MARTA station, and Atlanta looks like an episode of the Walking Dead. We eat breakfast and lunch at work at the company diner. 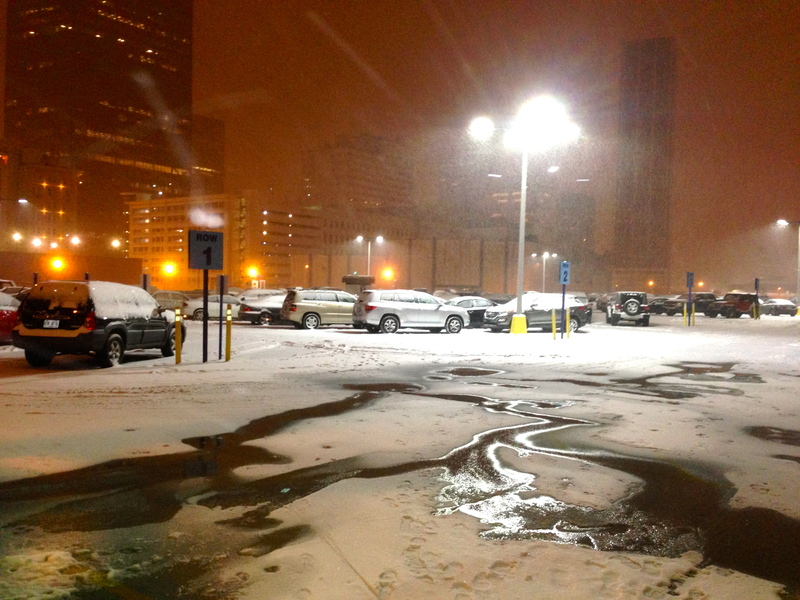 When we get back to Atlantic Station, it’s a winter wonderland. Unfortunately, everything is closed because nobody can get to work. Fortunately for us, Meehan’s is open, but they aren’t serving food from their Irish menu. Instead, we can only get beer. New Holland Dragon’s Milk (on the right) is one of my favorite high gravity beers. They age it in bourbon barrels and this gives it a strong bourbon taste. And at 10% alcohol, it makes us forget that we may not get dinner tonight. Eve gets the Samuel Adams Winter seasonal. It’s another fine beer for a cold night. You may notice pizza in the picture. Because Meehan’s wasn’t serving food, an enterprising soul had Papa John’s delivered for the entire place. This may not have been the best pizza we have eaten, but it may have been the best-timed pizza delivery ever. 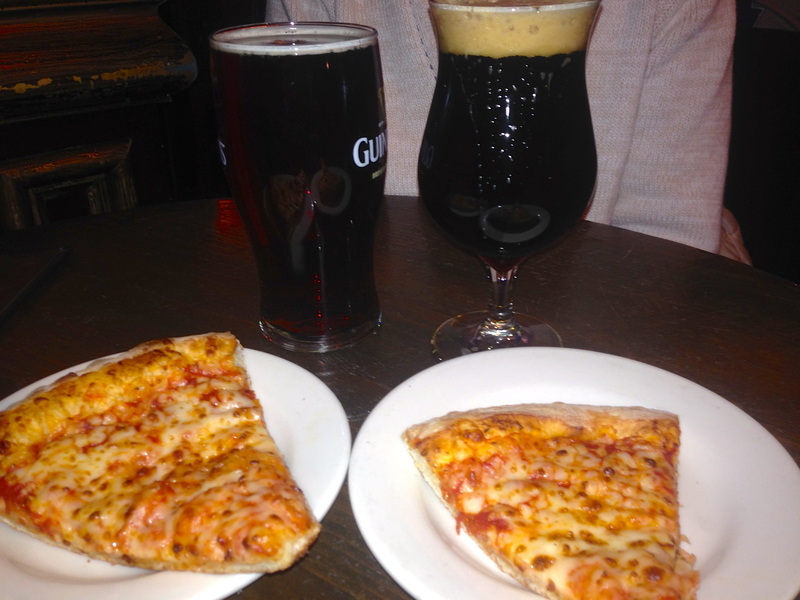 We enjoyed our beers and the atmosphere at Meehan’s, and will sample their Vinings location in the future. When we get back to our hotel, The Lobby restaurant is open, serving a limited menu. As you may have figured, The Lobby is located in the lobby of the hotel. 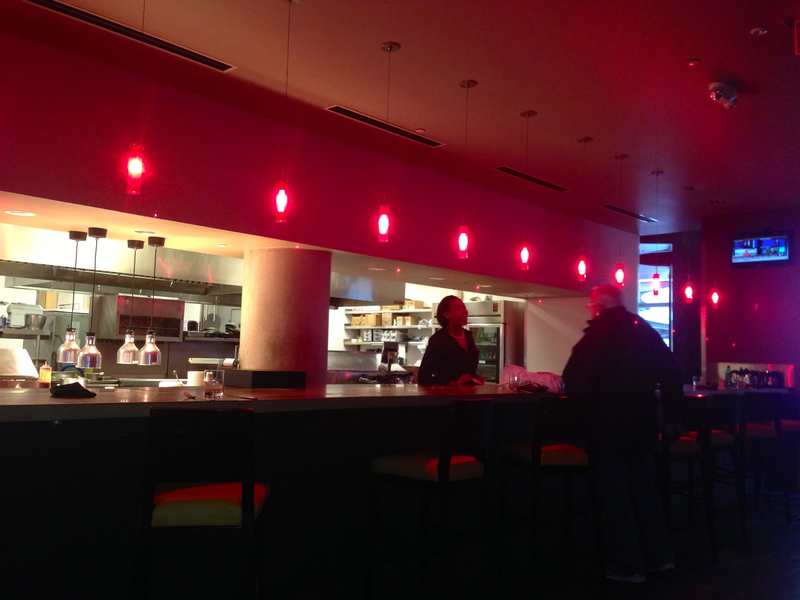 It’s got a nice bar where you can eat and watch them cook in the kitchen. 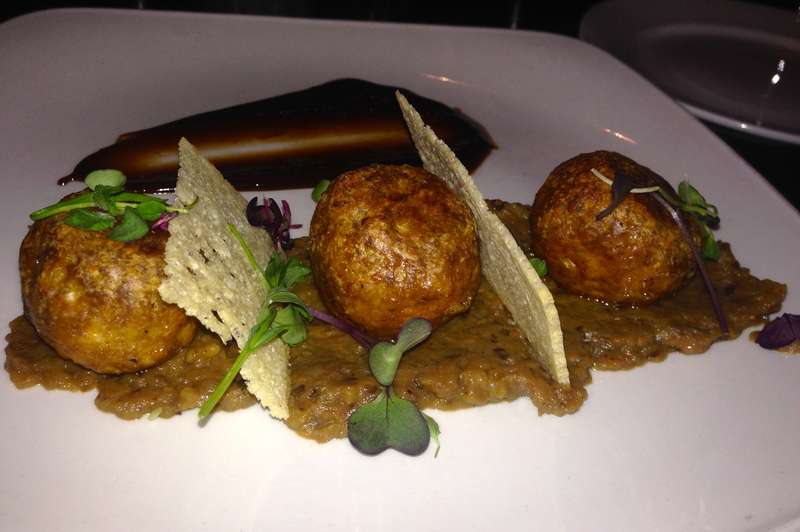 The first thing out of the kitchen for us is the lamb meatballs. These are tiny meatballs for $11 and come on a bed of crushed eggplant. They are good, but they should probably be bigger. Perhaps they are rationing the lamb because of the snow. There is a large open oven at the bar where they make pizzas. 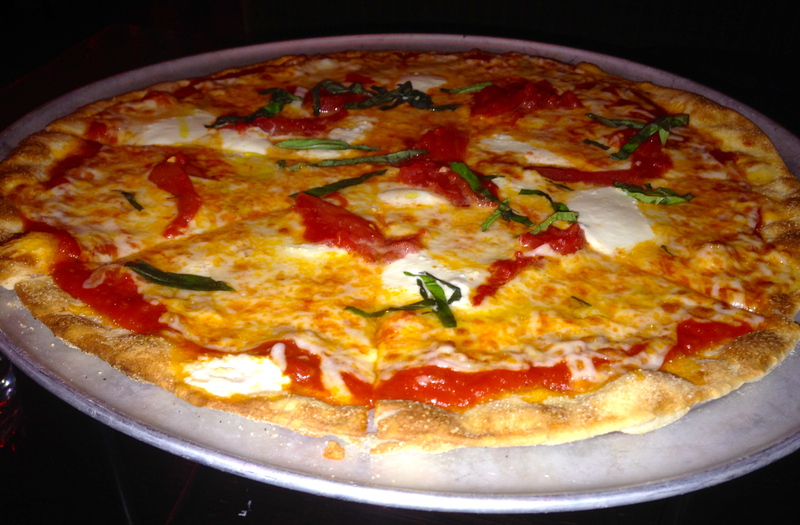 We order the margherita, which comes with sparse basil and a few chunks of mozzarella cheese. The crust could have been crispier, but who knows if the regular cook is working tonight. We are just happy that the place is open. I’ve got one more meal downtown on Thursday before finally heading back to Date Night headquarters in Cobb County. Fresh to Order has just opened at the CNN Center and the buzz from my co-workers has been good. They have done a nice job on the space, which used to be a bookstore. 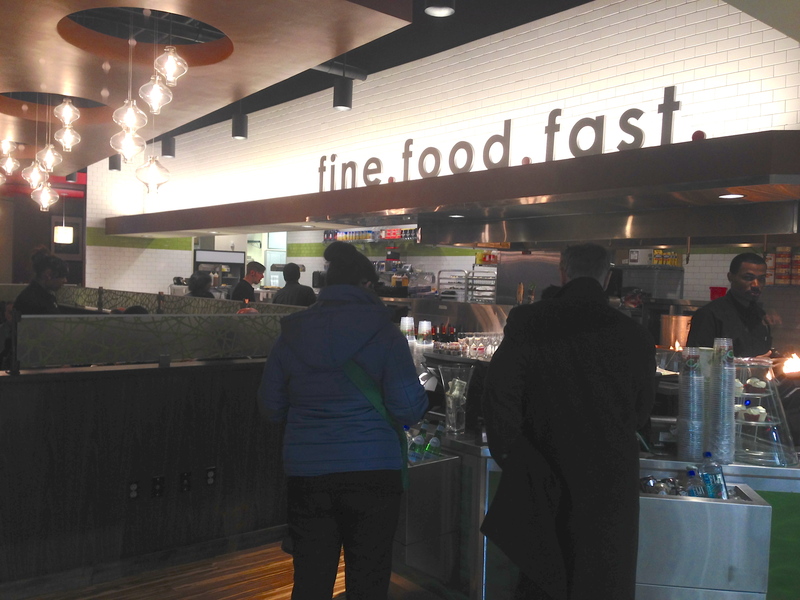 It’s open and inviting, and it’s nice to have this as an alternative to the fast food chains in the CNN Center food court. Their menu is surprisingly complex, with 15 paninis, 8 salads, and something they call “long plates”, which looks like entrees. 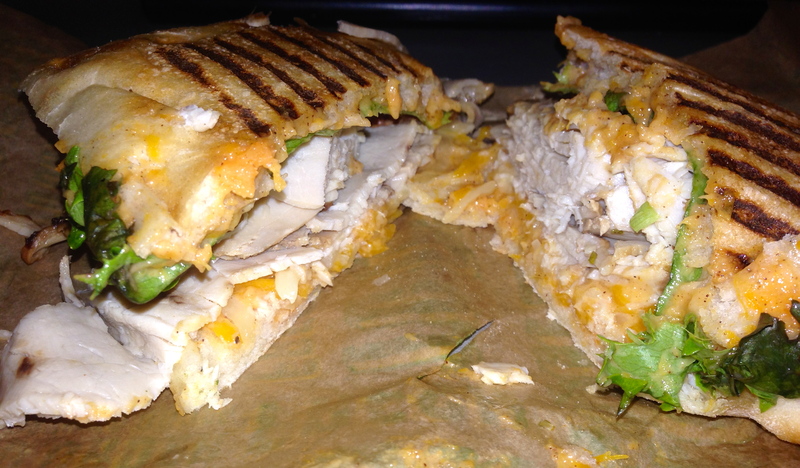 I order the pork panini on cibatta bread. It comes with lettuce, tomato, aioli, two cheeses, and caramelized onions, which I omit. This is a huge sandwich. It’s full of sliced pork loin, and the flavors work well together. It comes with a side for $9. 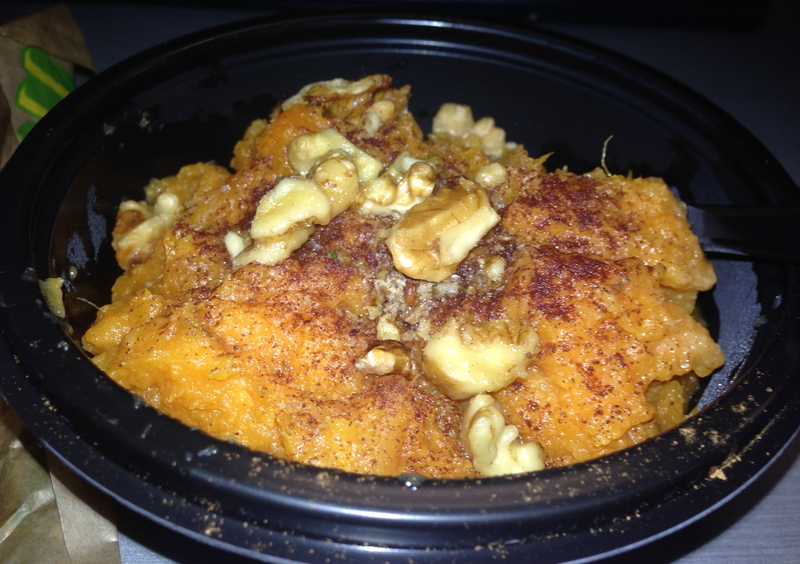 My side is the sweet potatoes, which are enough for 3 people. Eve and I could have easily shared this entire meal, but fortunately, she has headed home. I bring her my leftover sweet potatoes for a treat the next day. 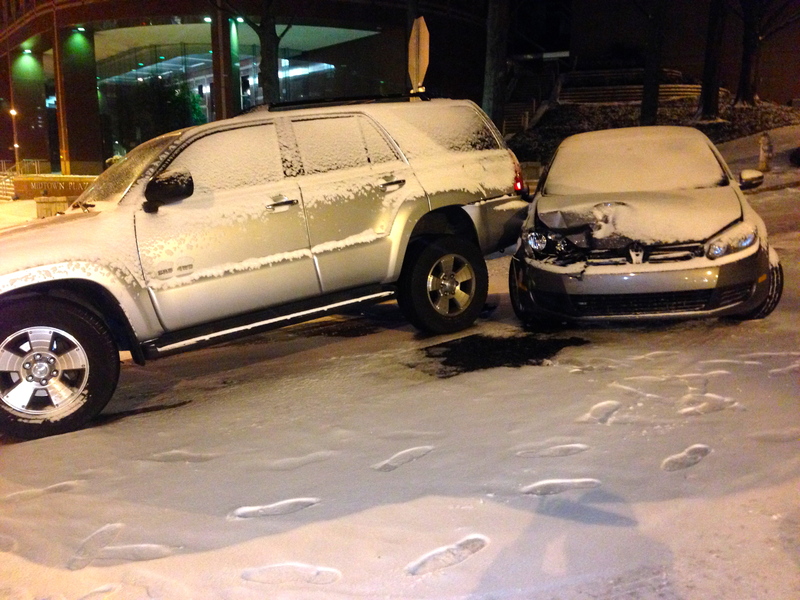 We survived the snow with only a few hassles and feel really bad for those of you who spent hours in your cars on the gridlocked highways of Atlanta.